With the holidays just around the corner, it’s important to have a holiday marketing strategy in place. With the help from industry professionals, we give you tips and tricks to make sure your holiday campaigns are the most effective they can be! With help from Hubspot blog we offer some tips and tricks to help your organization get organized for the holiday season! Just because we are all at home eating too much food, drinking too much eggnog and spoiling our families doesn’t mean the work disappears! Getting yourself prepared with a solid marketing campaign to send during the holidays and right away in the New Year can make a difference in preparing members for anything they need to know for 2018. The holidays are hectic! Get ahead of things and pre-plan and pre-write your New Years marketing strategies and emails. Sending out important information for the upcoming year can be one of the most crucial points for selling new memberships. Being prepared with your message and the delivery strategy of that message can help things stay organized. Donald, the President of Operations & Managing Partner at InboxArmy. “Create planning, creative, production, and deployment calendars to better execute your campaigns. Don’t wait until the last minute to decide what to do.” Having a 2018 calendar ready to go can save you a ton of time after the Holidays and reduce your stress load! Knowing that you have an awesome calendar or 2018 marketing strategy waiting for you at work can help make the holidays that much more jolly! Marketers send more emails than usual during the holiday season, but it’s important to remember that there’s a real person at the other end of your email communication. The holidays are a busy, hectic time for everyone and your members probably won’t appreciate having their inbox flooded with emails. Respect their time, and adopt a helpful, member-centric approach. 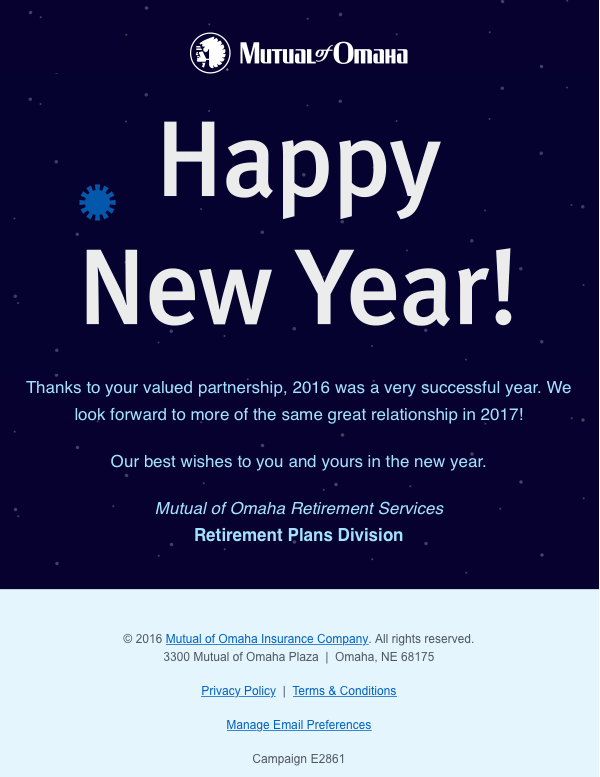 Check out this email sent from Mutual of Omaha, they didn’t add a sales pitch, just a message about warm wished. This can be a great way to connect with members over the holidays and remind them there are real people on each end. It’s the holiday season, after all, you can’t just pen down some sales oriented copy and call it a day. Visual, interactive elements like GIFs, cinemagraphs, and gamification will add interest and flair to your holiday messages this year. The holidays are supposed to be fun, not stressful! Tap into your member’s emotions, and focus on how you can help them spread joy through the gifts they can buy from you. Even a simple holiday greeting can go a long way in building trust with your customers. Being responsive is no longer just an option. Imagine a member opens your email or website on a smartphone or iPad and sees a broken design. This is certainly not the user experience you are wanting to provide, especially not during the peak holiday season! What if a potential new member gets frustrated and leaves? Dennis Dayman, Chief Privacy Officer at ReturnPath, is of the opinion that since 54% emails are now opened on mobile devices, there’s no option but to create a responsive design. Adding a dynamic countdown timer is a great way to create urgency in emails, and there’s no better time to use them than the holidays. Use a timer to promote any sales, events, reminders etc. Remember, you can play off of all of the holidays, not just the traditional ones. Consider getting a copy of Chase’s Calendar of Events each year or at least look at the special month holiday celebrations. A good way to bring in new members and increase retention would be to create promotions using Membee’s Promotions. Create discounts off membership, your online store, an event, or whatever you desire! Offering promo codes during the holidays can be a gift from you to your members! Offer your members multiple ways to connect and stay in touch during the holidays. Remind them of exciting things coming in 2018, try to keep social media posts light hearted and simple. Many of your members will be scrolling through their social media at work and at home during the holidays, send a happy holidays greeting showing appreciation for their memberships! 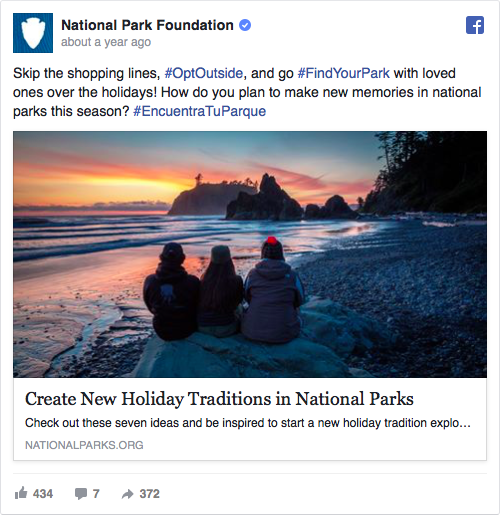 Check out the post below from the National Park Foundation. You can take this as inspiration for your own post, inspire your members with the very reason why they are members. Share a Happy holidays picture of your staff, a snowy landscape of your town, your cat taking a picture with Santa (we know you love it), or even just a simple happy holidays post! Add the hive on your social media accounts!